My first trip through North Carolina. After the fifth barbecue stop in North Carolina my brother-in-law and I were delirious. We stumbled out of the door of the last joint, nearly tripping over ourselves like a couple of drunk freshman. I called my wife but when I attempted to speak the right words wouldn’t come out. Sure my belly was full of pork, but it was something about the addition of coleslaw, hush puppies, and glass upon glass of sweet tea to the equation that produced some kind of odd chemical imbalance in my brain. I was drunk on pork, and I giggled at the buzz. It surprised the hell out of me. I thought I knew what North Carolina barbecue was before I ever set foot in the state. I mean, just close your eyes and what do you see? I figured I’d be eating a ton of pulled pork set on plain white buns topped with creamy coleslaw. That's what I made from scratch all those years ago. I knew the sauce would be vinegar-based, and I even knew that the western part of the state might add a little ketchup to that simple equation. But that's really it. And to be perfectly honest, I wasn't all that pumped for the drive. Seriously, how good could 5 pulled pork sandwiches possibly be? Turns out I was wrong...about a lot of things. When I ordered barbecue, the above picture is basically what I got every time. Now, you can find pulled--those sandwiches do exist--but by an large it means a plate of chopped pork, hush puppies, and some coleslaw. This turns out to be a very good thing. To pull pork you need to cook it until 185 to 195 degrees. But to chop it the internal temp need only reach about 165 to 180, leading to juicier hunks and also more fat. It's...um...better than pulled pork. Where did our mission begin? For help traversing the barbecue trail of North Carolina, I used Mike Mills and his daughter Amy Mills Tunnicliffe's Peace, Love, & Barbecue . It's been my guide to all things barbecue for the past couple years, and it's never let me down. Like my Memphis trip , I used their recommended Barbecue Shrines as the basis for my pilgrimage. That included Lexington Barbecue , Stamey's , Allen and Son , and Wilber's Barbecue . I also got a tip on Twitter from Amy Mills that I needed to visit The Pit in Raleigh, so I added that to the list. And so off we went to find out what North Carolina had to offer. The first stop was Lexington Barbecue in Lexington, North Carolina, which also happens to be the proud purveyor of...wait for it...Lexington-style barbecue. This style is sometimes considered synonmous with Western North Carolina Barbecue. Though the stereotype is not 100% true, this style of barbecue tends to be whole pork shoulders served with a vinegary sauce spiked with a little ketchup. And that's certainly what arrived. Lexington Barbecue more or less lived up to the expectation. It was juicy and vinegary, and the sauce was nice and spicy. Though Lexington Style Barbeuce does have a little ketchup in their sauce, it looks and tastes nothing like the syrupy, sweet sauces I grew up with. It was basically just a vinegar sauce with a touch of ketchup. A little douse goes a long way. Ketchup also makes its way into their famous red slaw. And though it sounds completely unremarkable, the slaw was outstanding, and easily the best on the trip. As was their sweet tea, which when balanced with the lemon, was slightly tart, sweet, and bitter. A perfect cup. This was also my first encounter with hush puppies in years, and they were delicious. It was a great stop, and if this place were in a three hour radius of Chicago, I'd think often about making the trek. All I missed was the smoke, which I sadly couldn't detect at all. The next stop was Stamey’s , which is right in the middle of Greensboro. It was early in the morning, and maybe my taste buds weren’t functioning at full stregth, but it seemed like a weaker version of Lexington Barbecue. Nothing really jumped out at me. The chopped pork was definitely juicy, and the slaw was fine. But I was just concerned at this point that maybe North Carolina barbecue wasn't my favorite style. I loved my time in Memphis , and even some of my haunts in Chicago . Maybe all this thin sauce and meat without smoke was what they liked down here. I'm not sure where exactly the dividing line between East and West is, but I felt the change as I pulled into Allen and Son in Chapel Hill. I knew the building looked right. It typified more than any other place a roadside shack complete with gravel parking lot, weathered sign, and laid back dining experience. We ordered the barbecue plate, like we had at the other two stops, and what arrived looked slightly different. Each bite was a revelation. The slaw was crisp and cool, the sweet tea not too sweet, and hush puppies had a cripsy cornmeal outside, with creamy buttermilk laced innards. Remarkable. But it was the pork that floored us. It was the first eureka moment of the trip, and one of the most delicious bites of barbecue I’ve ever tasted. The chopped pork was less wet, and, for the first time, generously graced with hickory smoke. The sauce had dispensed with ketchup, and was a perfect foil for the fatty meat. It was the moment when I first grasped the allure of chopped pork. It wasn’t just the inside of the pork, but the crispy crust, too. Every bit of the shoulder was chopped up and mixed together, giving each bite color variation. Although their sauce was like the Eastern Style, they still only cooked pork shoulders. As I walked away I was convinced that I had reached perfection. How could these last two places come anywhere close? The Pit was the first barbecue restaurant I'd ever seen with Valet Parking. The Pit is a relatively new restaurant in Raleigh with a slick new design and absolutely none of the rustic charm of Allen and Son. That's fine, because the brains and brawn behind the operation is Ed Mitchell , a legend of North Carolina barbecue, whose Mitchell's Barbecue was already a potential stop. The restaurant may look new, but the cooking technique was hundreds of years old. The Pit was also our first experience with the whole hog barbecue. Though Allen and Sons was a tentative step into Eastern North Carolina, we were now going to be tossed straight in. Eastern North Carolina style barbecue is far more than just vinegar based sauce. 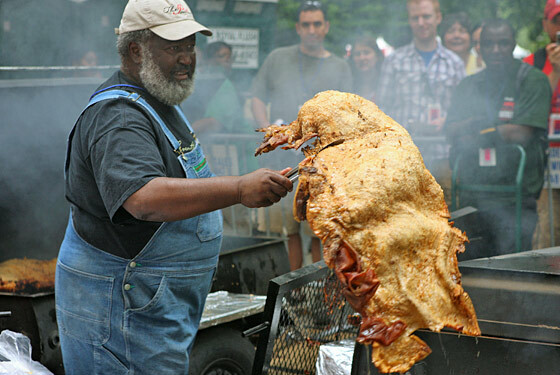 According to the traditionalists, barbecue is only barbecue when a whole hog is cooked over hard wood coals. And according to this menu, the chopped barbecue is the Eastern North Carolina style. Little bits of everything were chopped together and served with coleslaw, hush puppies, and, for the first time, a bowl of black eyed peas (awesome!) and a biscuit (fine). To be honest, I was initially a tad disappointed by the lack of smoke in the meat. But something else became apparent after a few bites. It was chewier and the flavor lingered longer in the back of my mouth. I couldn't place it at first, but after a few bites I realized that it simply had far more fat. This whole hog approach meant that the mixture of fat to meat was much higher, and that made for an incredible piggy flavor which is utterly intoxicating. The flavor is "porkier" and more well rounded. The sauce is virtually non-existent, except for a subtle zing of acid at the end of each bite. I didn't need to add any sauce at the table. By this point I was quite obviously full. The last stop was far off the interstate in the town of Goldsboro. It was hard to find, and a few times both Matt and I felt like skipping it. We didn't need the pork, and we couldn't fathom how it could top The Pit. We pulled into Wilber's Barbecue without an ounce of hunger between us. The hushpuppies were average, the coleslaw was overly chopped, and the sweet tea was just fair. They did add a bowl of decadent chicken gravy to the table, but I just wasn't in the mood for it. But the pork, a whole hog just like The Pit, was simply flawless. It was fat and luscious like the Pit, but was laced with a wonderful tinge of Oak smoke. The sauce was even served in this gorgeous little glass container. But the pork didn't need any help. We tried our best, and though it was the best pork we had tasted on the trip, only managed to finish half. The waitress packed up the rest for us and sent us on our way. Matt and I rolled into our car, sweating pork, and utterly convinced that we had just tasted hog heaven. Though I didn’t understand North Carolina barbecue when I first arrived, I had eaten my way through the state, and became quite taken with the style. Hopelessly more complex than I had bargained for, the chopped pork also felt more honest. Pork was the real star of the show, not the sauce or the cooking method. It only needed a little bit of help to make it perfect. As we drove away I clutched the small container of Wilber's pork close by, inhaling the fumes of perfect pork as we raced away in search of vegetables.